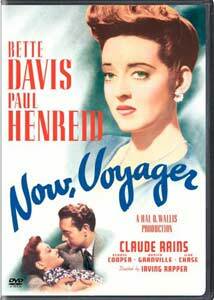 I hope I never get too cynical to enjoy obviously sentimental claptrap like Now, Voyager. It's an old-style weepie of the first order, high melodrama from a time when Hollywood could pull this stuff off on a grand scale, without knowing, wiseacre winks; and it's got more great hats in it than just about any film I can think of, with the exception of The Women. And it stars Miss Bette Davis—I admit to liking her better with her fangs bared, in full-bore Margo Channing mode, but this will do just fine, thank you very much. This is also the only rival to The Heiress for Hollywood's best spinster movie, and goodness knows that's a title far overdue for a DVD release. Anyway, to the matter at hand: Davis stars as Charlotte Vale, the maiden aunt of a Boston Brahmin family, and, unlike her siblings, who wisely escaped, Charlotte is absolutely hobbled by her domineering monster of a mother. We meet Charlotte when she's close to a nervous collapse—so close, in fact, that one of her sisters has whisked in Dr. Jaquith, a psychiatrist with a Vermont sanitarium pastorally called Cascades. Perhaps a stay at this magic mountain will be the very thing to keep Charlotte from complete psychological meltdown. Charlotte of course resists the very notion that something's wrong with her—in the movies, everybody must, prior to their conversion experience—but taking the air at Cascades and working out her mother issues with Jaquith (nicely played by a rumpled Claude Rains) does wonders for our Charlotte, who drops those extra pounds, dyes the gray out of her hair, and heads off on a restorative cruise to South America. There's still no man in her life, but there's nothing like an ocean liner to right that wrong, and Charlotte meets the lovely, delicate, and tragically married Jerry Durrance, played by Paul Henreid, just a year before his indelible turn as Victor Laszlo. What of Jerry's problematic off-screen wife? His two adorable daughters? What of the unparalleled personal connection between these two lost souls, hungry for one another? That's the juice of the movie, and it drives us through some great soapy episodes, including Charlotte finally facing down her mother, and her socially desirable but emotionally tepid engagement to Mr. Livingston, the leading light of a Boston family more prominent even than the Vales. Bette Davis really is absolutely ripping as Charlotte—never one for much subtlety, she juices up Charlotte's longing, inhabiting it, yet never mocking it. Henreid is lovely, too—after seeing him repeatedly light two cigarettes in his mouth and handing one to Charlotte, it makes me want to start smoking again, and to try to convince the wife to take up the habit, if only because in that one moment we'd look so impossibly romantic and cool. What's notable, too, is the movie's almost touching faith in psychiatry—it's not clear just what it is that Dr. Jaquith does with his patients, and this mental hospital actually seems more like a high-end resort, much more Club Med than One Flew Over the Cuckoo's Nest. It's too much to claim that this is a great movie, and it doesn't even really want to swing for the fences—before the term was invented, this was as good as the studios ever did at making a chick flick. And even if much of it seems improbable and feels overwrought, it's likely to get you rooting for our Charlotte, even long before the famous and glorious last line. Image Transfer Review: Very handsome transfer, of a print that seems to have been quite well maintained or restored. The images have a radiance to them, with strong blacks and careful gradations. Audio Transfer Review: Composer Max Steiner lays it on pretty thick, which is appropriate, though now and again his score subsumes some of the dialogue on the mono track. Extras Review: Aside from a trailer and a brief biography for Davis, the only extra is a package of six music cues, most of which are medleys, showing off Steiner's work in all its syrupy glory. An old-fashioned tear-jerker of the first order, and as soapy a movie as has ever been made. Bette Davis leads a spirited crew, and you're too hard hearted if you can't muster up some affection for this one.